Belleville may soon begin to see some unusual sports teams coming to town as part of the plan to grow tourism in the Quinte area. Ryan Williams, president of the Bay of Quinte Tourist Council, says everyone is targeting hockey and curling in the winter, but Quinte needs to do something different. “We really think the best strategy is to go after events that haven’t been really looked at,” he said. Those events could include wheelchair basketball, sledge hockey, ultimate disc, sailing, regattas, wakeboarding, and waterskiing. In 2009, Hastings County brought in $335 million in tourism, about $4.5 million came through sports tourism, according to a Premier Rank provincial study, he said. Williams says they hope to increase that up to $30 million. They’re looking for tourism that will utilize the facilities Quinte offers on a daily, monthly, and multi-seasonal basis, said Williams. “I think that’s attainable in five to 10 years,” said Williams. Gary Smith is the general manager of the Ramada Inn in Belleville, one of the hotels many that hosts sports teams. “One sports group rule is know another sports group, wherever it is, whether its football, soccer. They hear about how well things go and then it helps business in the future for other groups,” said Smith. The Quinte region has seen many sporting events through local sporting teams, but according to Williams the first sports event through Bay of Quinte tourism happened unexpectedly. “The first thing we did was we went to the sports tourism conference in Ottawa in May. When you go to one of these things you don’t start to expect anything until at least 2014-15, at least two or three years because you have to plan it and get it organized,” said Williams. At the conference they met The Ontario Disc Sports Association. Two months later, Belleville was hosting the provincial ultimate disc championships. 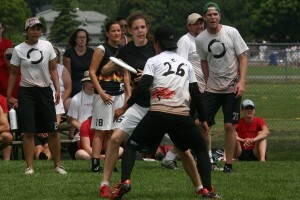 Christopher Lowcock, executive director of disc sports association, said one of the things he looks for is the highest quality playing fields. Lowcock is trying to grow the sport and said the size of Belleville was also an attraction. “Sometimes when you play in a larger city you get lost in the shuffle. You put a press release out and don’t hear back from them,” he said. Right now, those are the kinds of events Williams is trying to attract. They’re looking for a lot of things that are a little different and really use the facilities in the area, said Williams. Smith says they treat all sports teams with the same service, no matter how big they are. “It’s not a matter of small or large to us, smaller groups grow bigger and we look to the future of them growing, becoming larger,” he said. In the long run, Williams is looking for anything from school sports to nationals, from broomball to under-19 hockey. “And then traditionally we’ll go after curling, we’re going to go after hockey,” said Williams.